SERP provides certain services to the community in the form of work crews. Services include: Parking Lot Cleaning, Lawn Care, Junk Hauling, and Flyer Delivery. Lot Cleaning can be done on a regular schedule or as needed. Lawn Care includes mowing, edging, application of bark dust and some pruning. All services are available in any area(s) you desire on the east side of Portland or the Oregon City area. During the Summer months many customers schedule lawn care on a regular basis. All employees of these crews are paid at least minimum wage and accumulate paid leave as well. Get good quality work at a reasonable price! To get a quote or to schedule lawn care, parking lot cleaning, hauling, or flyer delivery, call Dave at: 503-761-7393. To view our lawn care flyer, click here: Lawn Care Flyer. To view our junk hauling flyer, click here: Hauling Flyer. To view our flyer delivery flyer, click here: Flyer Delivery Flyer. To view our lot cleaning flyer, click here: Lot Cleaning Flyer. 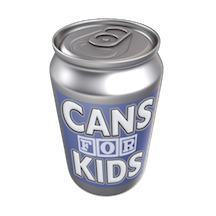 Since 1997 Cans for Kids has collected donations of redeemable cans and bottles from businesses all over Portland to provide jobs for adults with disabilities and funds for Mi Casa, a children's home in El Salvador. Through its associations with Mi Casa (www.micasakids.org), Cans for Kids is a 501(c)(3) non-profit registered in the USA.